Little Dude is now getting the hang of doing activities at home, and he won't forget to remind me that he wants to 'do something' every day! Now with him, any activity that needs to be done has to be set up fast, because he wants to do everything himself. I also don't want him to lose interest, so whatever we do has to done quickly. 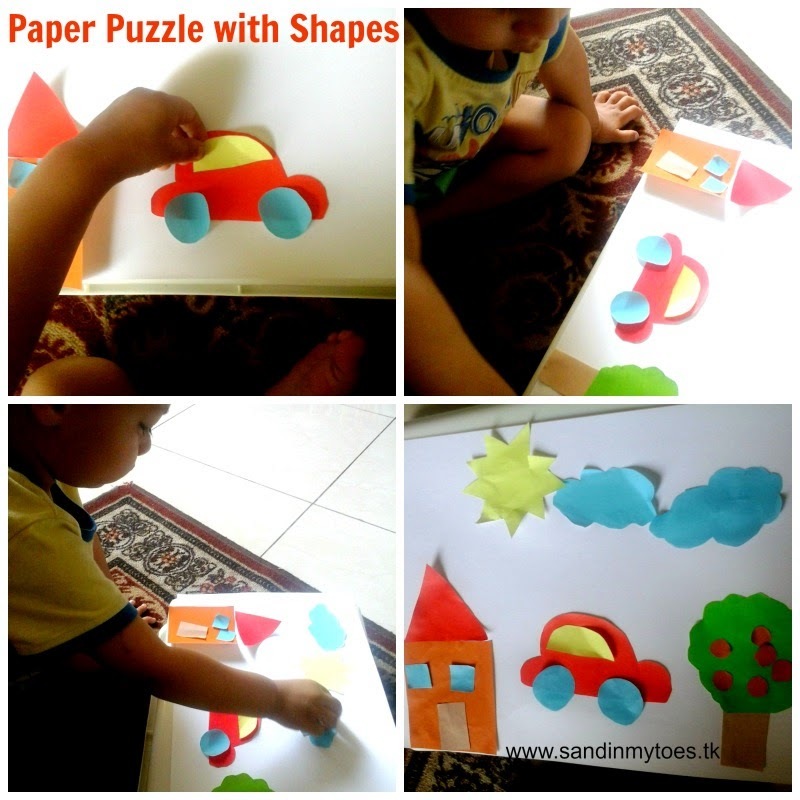 Today, I made him a simple paper puzzle by cutting out different shapes to form a 'scene'. I cut out the different elements for a house, car, tree, clouds and the sun. While I was doing the cutting, it took every ounce of Little Dude's patience to wait for it! Next, I assembled the puzzle to show him what went where. Then, I undid the puzzle, and gave him the shapes grouped into the different elements. So, the house shapes were in one pile, and so on, to make it easier. He had a go, and didn't do too badly, with a little help from me. We undid it one more time, and this time, I used a glue stick on the shapes, so we had a picture to put up on the fridge! He enjoyed it immensely, and I would like to use card stock next time instead of paper, so that it's easier to handle and lay out. 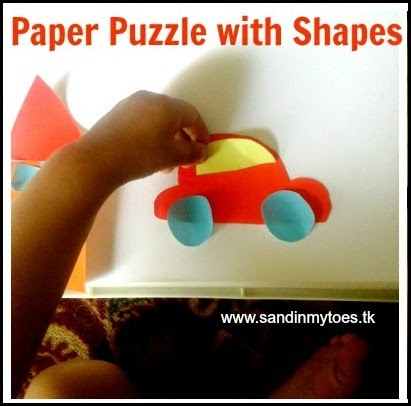 I think this activity is a great way to teach shapes, hone memory skills, and also sharpen fine motor skills (such as putting the oranges on the tree). The possibilities are endless, and I'm sure we'll be making many more puzzles in the future! Magic Moments, What's The Story?, Let Kids Be Kids, and Creative Challenge. Love this activity! My toddler is super into puzzles right now, so it's perfect. Great activity, I'll have to remember it when Arlo gets a bit older! Cute, fun, easy, I love it! My girls always want to make a project (but they call it a "product") and I'm sooo not crafty. I could do this one though! My toddlers love activities like this! this is a super idea and great for learning too!! so win win in my book! This looks very entertaining! I am definitely trying this with my little one very soon. He is loving all the new things that we are doing at the moment and I am sure I am going to have as much fun. Thanks for sharing this. I'm sure it will be fun! Hope you have fun with it, Katie! Yes they are, and he's always loved them! As you can see from the cut-outs, I'm not that crafty either! That's why I do super simple activities. Puzzles are always a hit, aren't they? Thank you, Charly! We try to do whatever we can at home, to have some fun. Thanks Kathy, it can be made suitable for any child. I'm sure he'll love it, let me know how it goes! Haha, eating the puzzle just won't do! That's a fab idea, with lots of learning and fun. My eldest is studying fractions in school now so we have a similar activity. Thank you, we like to stick to simple activities! That's another interesting use for shapes! Sending love to you both. Looking forward to more interesting ideas from you! Thanks, Nishana! Nothing can quite compare with handmade things. Yes, toddlers can hardly keep still! Thanks for stopping by. Glad you liked it, and I hope Boo has a good time with it!